Upper aquifer-mostly sand and gravel with some fine-grained lenses. Most of the unit is composed of coarse-grained glacial deposits (geologic unit Qgc), and the sand dominated part of the finer-grained glacial deposits (Qgf). Unit also includes morainal deposits of the Pend Oreille lobe (Qgt), stream alluvium (Qs), and dune sand (Qe). Upper confining unit-mostly silt and clay with some sand. Contains coarse-grained material in places. 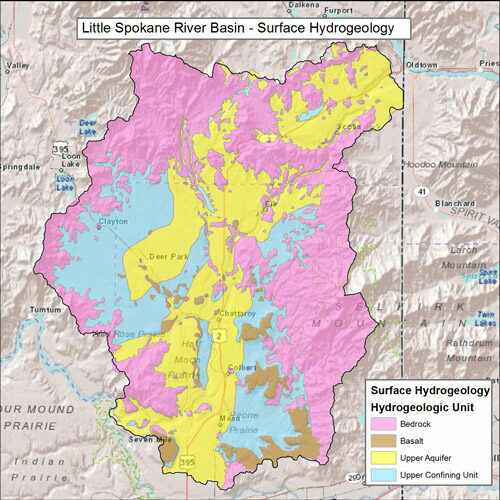 Unit is composed mostly of glaciolacustrine material deposited in ice-dammed lakes (clay dominated part of Qgf), lacustrine and fluvial deposits of the Latah Formation (Ml), and minor amounts of the most distal and finegrained part of Missoula flood deposits. Unit contains mass-wasting deposits (Qmw) at the base of basalt-capped bluffs where the predominant landslide material is slumped blocks of Latah Formation and basalt fragments. Basalt-Wanapum (B1) or Grande Ronde (B2) Basalt of the Columbia River Basalt Group; includes thin sedimentary interbeds in places and overlying loess. Includes geologic units Mw and Mgr and small amounts of Qe. Bedrock-mostly granite, quartzite, schist, and gneiss. Includes geologic units TKg and p m, and thin and discontinuous stream alluvium (Qs), loess (Qe) and mass-wasting deposits (Qmw).